Udupi, Feb 13, 2017: Due to a call for Udupi district bandh on Feb 13, Monday, by the Toll Virodhi Horata Samiti opposing toll collection at the plazas at Hejmady and Sasthan, the district administration has clamped prohibitory orders under Section 144 of the Criminal Procedure Code in Udupi taluk, Udupi city municipality and a two-kilometre radius of NH 66, from Thekkatte to Shiroor, from Feb 12, Sunday midnight to Feb 13, Monday midnight. A notification by DC T. Venkatesh, said that the imposition of prohibitory orders was necessary to maintain law and order and protect public property. N. Vishuvardhana, Additional Deputy Commissioner told media that over 450 police personnel will be pressed into service. “Forceful stoppage of buses, shutting down of business establishments or blocking of National Highway will not be tolerated and stern legal action would be taken against those indulging in such acts,” he said. Schools to work: Diwakar Shetty, Deputy Director of Public Instruction (DDPI), said that no holiday had been announced for schools. “The local headmasters will decide on holiday depending on the situation,” he said. 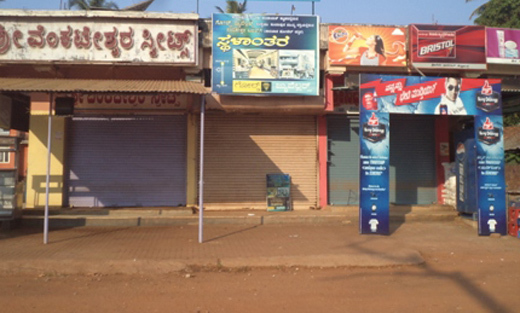 K. Suresh Nayak, Secretary of Canara Bus Operators Association, said that the association did not back the bandh and will run private inter-district buses and private city bus service in Udupi. Deviprasad Shetty, leader of the samiti, said that the bandh will be in force from 6 a.m. to 6 p.m. in the district. Emergency services including ambulances, milk and medicine were exempt from the bandh. In light of the Udupi district bandh call by the Toll Virodhi Horata Samiti opposing toll collection at the plazas at Hejmady and Sasthan, the district administration has clamped prohibitory orders under Section 144 of the CrPC in Udupi taluk, Udupi city municipality and a two-kilometre radius of NH 66 from Sunday midnight to Monday midnight.